If it's pink, I'll take it. If it's got sequins I'll take it. And no doubt if it's from Motel Rocks I'll be sure to take the hell outta it too. 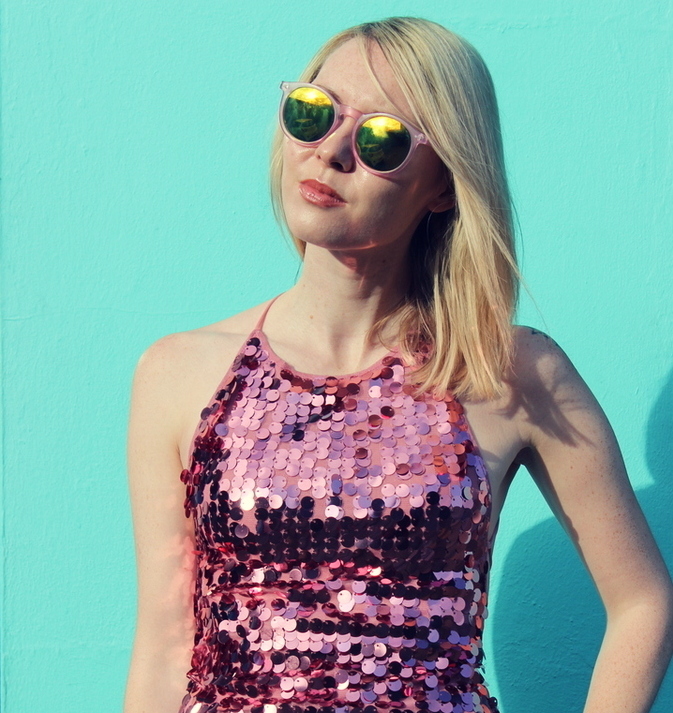 This backless rose sequin Hedi mini dress from Motel Rocks seemed like the perfect sequel to the previous Motel metallic rose dress I've rocked before on the blog. I know most fashion blogger gals can probably relate that if you like a dress enough, you damn well have to buy it in a similar style! That's the only problem with Motel, they keep launching and launching these tempting trends and well... my bank is going to go krupt. 90s vibes are a big deal and Motel Rocks seem to strike it right every time. I can't wait to wear this dress more in the hotter months. Although ridiculously unpractical (aren't all my clothes for the blog tho), I can definitely see it making waves at the beach. The bonus of course being that I won't have to freeze my a$$ off to wear it. No sunflowers featured in this shoot (unfortunately, dammit) but instead a shell shop backdrop to keep my sea-salt soul satisfied. I'd been enchanted by this aqua hued shell shop for a long while and wanted to make it my mission to shoot here at some point. After we shot this party NYE look, I knew I wanted to start getting more and more experimental with photoshoot backdrops, and so the idea for the shell shop came about. Hence our day out in Folkestone last week, and after Graham had kindly spoken to the owners and shown them my blog business card, they said they were more than happy for us to get some shots outside their gorgeous shop. I thought that was so kind, especially as they were re-stocking at the time. They said that we should come back in the summer when it's not so cold, and I'm definitely dreaming of that. You can't beat unique gift shops with friendly owners and of course, the pretty beach-y shopfront has my heart 100%. It's my birthday next Tuesday so Graham's sweetly taking me away tomorrow night and we're staying away for a couple of days which is just the loveliest, I can't wait! I also think this pink glitter affair is appropriate for a pre- bombin' birthday look; whatddya think? I'll be back mid next week and getting back in the groove of blog commenting which I've fallen so far behind on. Bring on the celebrations! Are you feeling Motel Rocks's stock? What trends are you looking forward to for Spring? This dress is bloody perfect for you and your pink summer vibes! Of course I love the glitter sequin style and yes Motel Rocks are killing the 90's vibes. Being a 90's baby myself I love the trend! That shell shop looks so cute and daint, I'm so glad they was ok with you shooting outside it because it makes an amazing backdrop, you should definitely go back during the summer like they said. Happy Birthday to you and I hope you have a fab time away, February is the best month for Bdays hehe. Can't wait to see what amazing outfits you put together next beaut! 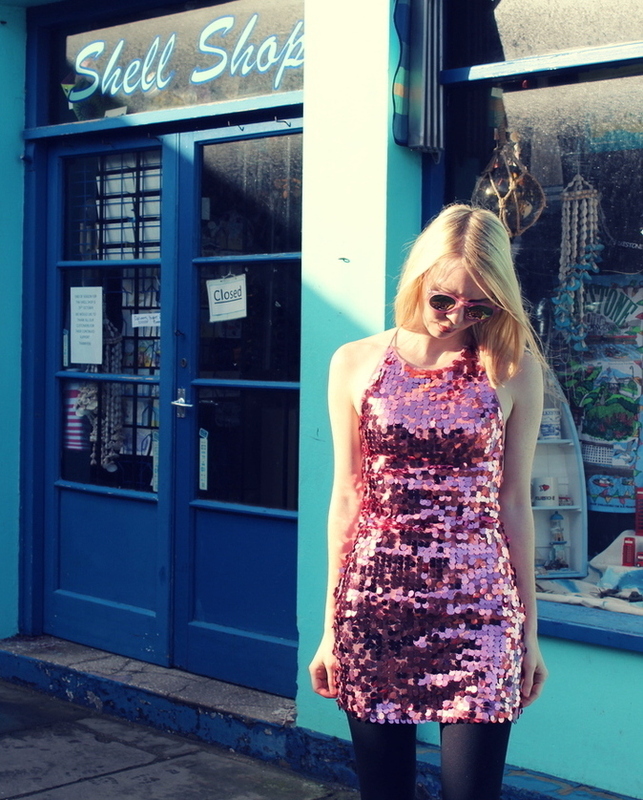 A sequin covered dress? Yes please! I feel like I need my own for Spring now. This one is lovely, and it looks fantastic on you! Happy Birthday Sophie, and I hope your trip is/was amazing! That dress is so pretty, and I love how you teamed it with tights (so it's wearable for the winter). That's nice the shop keeper allowed you to take photos there, I can see why you wanted it as your backdrop! What a gorgeous outfit! Pink and glittery! Right up my street ! You look fabulous! Happy late birthday! Hope you had a fab time celebrating! Such a fabulous dress, I adore combination with these sunnies! You look gorgeous! That's a very pretty dress. Fab look. That dress is so damn amazing on you. I love the colour and sparkles. And nothing like a certain cut that looks amazing on. I too have to have all the styles when I find pieces like that. Currently it's silky duster coats. Happy belated birthday, that dress looks gorgeous! Happy Birthday hun!!!!! I hope Graham truly spoilt you on your wonderful weekend away. I know I've said this before, but Motel Rocks should honestly hire you as their face, as you rock all of their clothes so freaking hard!! This sparkly pink dress is so showstopping, I can imagine you sizzling on a Miami beach in this and making disco ball reflections in the sand. DAZZLE BABE! The shell shop backdrop really floats my boat too, it's so lovely of them to let you shoot there. That outfit definitely calls for celebration! Hope you had fun/or having fun on your getaway. And happy happy birthday, gorgeous! Girl, you should most definitely model for Motel Rocks, as you rock every single design so incredibly well! This dress seems like it was made for you with its 90s and mermaid vibes and that shade of pink is just perfect, especially against the blue hues of the Shell Shop. How sweet indeed they let you shoot there, these photos turned out so beautifully well! This look is stuff off cocktail party, pink champagne, star studded dreams! 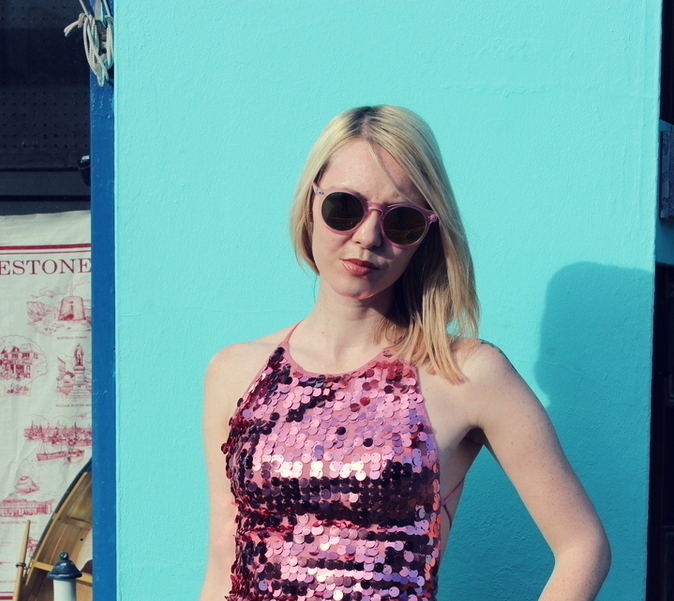 That dress looks so gorgeous in the sun, a glittery sun drenched ocean of sequins. I can oh so relate to buying an outfit in all about every colour if I can't resist it... can't have too much of a good thing though right? That portrait shot of you is amazing - like you're rolling through Hollywood in 'chevy, wind in hair.